"Most of the crackpot papers which are submitted to The Physical Review are rejected, not because it is impossible to understand them, but because it is possible. Those which are impossible to understand are usually published. When the great innovation appears, it will almost certainly be in a muddled, incomplete and confusing form. To the discoverer himself it will be only half-understood; to everybody else it will be a mystery. For any speculation which does not at first glance look crazy, there is no hope." Still, this is mostly true for theoretical physics. 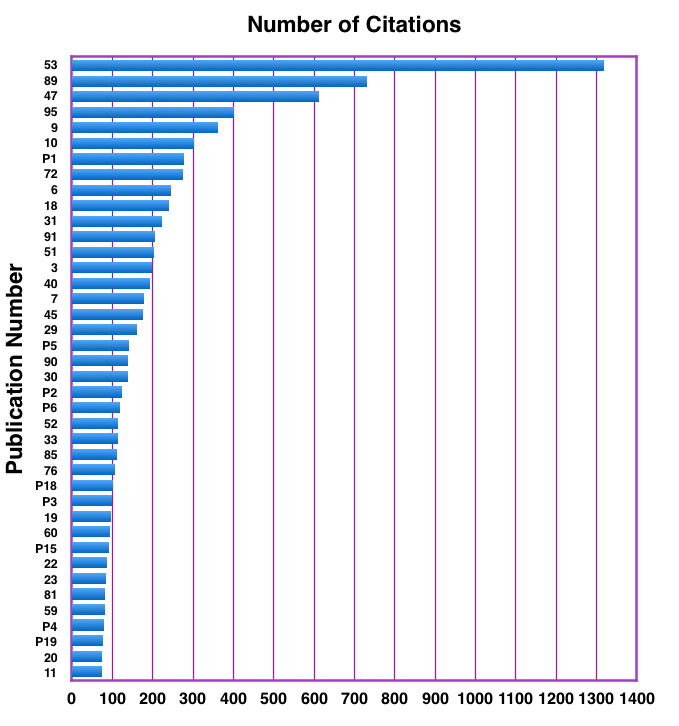 Although great significance is attached to citation frequency in the academic scientific world, it is sometime difficult to know what drives interest in an individual publication. Some are review articles that are written at the right moment. Some present new results in hot areas of emerging science. Other publications describe experiments that yield interesting results, more or less by accident. Others describe work that enable others to do new experiments, or better, that make a hypothetical proposition that motivates new experiments. Still, as anyone with experience will attest, many innovative ideas go unappreciated. E primarily refers to an experimental result. M primarily refers to an experimental tool or methodology. T primarily refers to a theoretical observation or molecular modeling study based on structure or simulation. Structural Origins of High Affinity Biotin Binding to Streptavidin. High Density Miniaturized Thermal Shift Assay as a General Strategy for Drug Discovery. Use of an Imaging Proportional Counter in Macromolecular Crystallography. Thermodynamic Stability Of Carbonic Anhydrase: Measurements Of Binding Affinity And Stoichiometry Using Thermofluor. An Hypothetical Structure for an Intermolecular Electron Transfer Complex of Cytochromes c and b5. Structure and Function of Cytochrome c.
Crystallographic and Thermodynamic Comparison of Natural and Synthetic Ligands Bound to Streptavidin. The Structure of Oxidized Cytochrome c2 of Rhodospirillum rubrum. Protein Crystal Growth in Microgravity. A Free Interface Diffusion Technique for the Crystallization of Proteins for X-ray Crystallography. Structural Bases for Function in Cytochrome c: An Interpretation of Comparative X-ray and Biochemical Data. System, Method and Computer Program Product For At Least Partially Automatically Generating Chemical Compounds Having Desired Properties.